Hardcover cloth with inset picture with plastic screen printed dust jacket: 80 pages with 55 Duotone black images and water based varnish: 207mm (W) x 207mm (D) / 8 x 8 in. Printed Offset 500 copies only. ISBN: 9780987305046 Markus Andersen’s photographs feature the city of Sydney as an abstracted backdrop for a fragile human presence, one dwarfed by overwhelming architectural development and consumerism. In these moody black-and-white images, people scurry about and are literally exposed by light. Struck by shafts of illumination between buildings, they are like insects coming out for food. With a title taken from Dylan Thomas’ famous poem (‘Do not go gentle into that good night …. 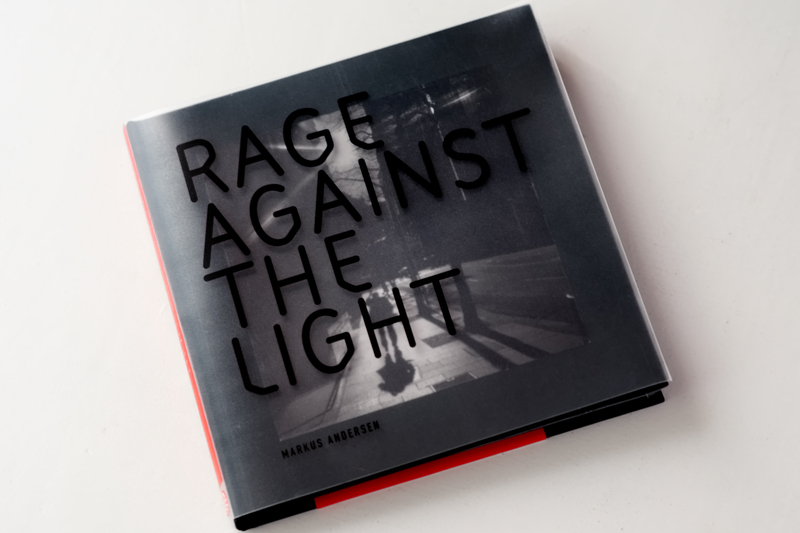 Rage, rage against the dying of the light’), Rage Against the Light features analogue and digital photographs in which Andersen captures bleak city vistas inhabited by people who are often solitary and lost in thought. He admits to being drawn to the ‘darker side’ of this city but his images are also marked by flourishes of whimsy and irony. The introductory essay in Rage Against The Light is written by Sandy Edwards, curator and co-director of the highly respected Stills Gallery in Sydney. Edwards also works as an exhibiting artist/photographer and is the founder of ARTHERE, an organisation that provides services to photographers throughout Australia. The essay Baby, it’s cold outside was written by the book’s Editor, Andrew Gaynor. He is a freelance curator and writer based in Melbourne.